LaRae Bartholomew Chatelain, 94, formerly of North Logan, Utah passed April 8, 2019 in Valdosta, Georgia. She was born September 24, 1924 to Ray Calvin and Martha Wintsch Bartholomew of Fayette, Utah. Ray farmed and tended sheep during the lean years of the Depression, and Martha was Fayette Postmistress for over 30 years. LaRae had a thirst for learning and travel. She graduated Utah State Agricultural College in June, 1946 and was employed in Snowflake, Arizona. However, she met her eternal love, Jack Chatelain, at a Mutual party up Logan Canyon, just a week before graduation. They were married in the Manti Temple November 29, 1946. Jack earned his MS in Physics while LaRae taught at Bear River High School. Jack’s pursuit of a PhD in Physics took them to Berkeley, California; Las Cruces, New Mexico; Madison, Wisconsin; and finally Lehigh University in Pennsylvania. Along the way they welcomed Ann (1951) and Ed (1955). Jack was hired by the USU Physics Department and they moved to Logan in 1957, welcoming Pete in 1960. LaRae earned a BS in Botany (1967), and a MS in Household Equipment (1969) from USU. She taught Housing and Household Equipment at USU from 1969-1987. LaRae earned her Doctorate from Florida State University in 1981. A move to North Logan in 1973 allowed Jack to build greenhouses for their budding orchid collection. A retired LaRae made fancy orchid bouquets for the Logan Regional Hospital Gift Shop, delighting Cache Valley residents for the next 30 years. LaRae and Jack loved summer reunions with Ann (Steve), Ed (Margie), and Pete (Kris) and their families! After years of remission, however, Jack passed from prostate cancer in January 1999. LaRae traveled with daughter Ann to China, Thailand, Egypt, Greece, Venezuela, Chile, and Hawaii. Ann’s husband Steve arranged their itineraries, while Logan Bingham tended the orchids. 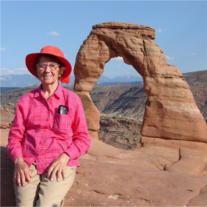 LaRae hiked to Delicate Arch at age 86! When failing eyesight closed her cherished orchid business, she moved to Valdosta, Georgia in 2016 to be with Ed and Margie. LaRae loved the warm climate and the green countryside, but so missed her dear Logan friends! She treasured monthly family visits from Ann and Steve, and Pete. As her memory began to fade, she fondly recalled her early days, family gatherings, and yearned to go home to Fayette. LaRae was preceded in death by her parents, 2 brothers and 4 sisters, granddaughter Leslie, and daughter Ann. She is survived by her son-in-law Steve Moosman of Cocoa Beach, Florida, son Ed (Margie) of Valdosta, Georgia; grandson Court (Sarah) and great-grandsons Oliver and Anthony of Canton, Georgia; and son Pete (Kris), grandson Shaun (fiancé Ally), and granddaughter Kelli of Bountiful, Utah. Funeral services at Allen-Hall Mortuary, 34 East Center, Logan, Utah on Saturday, April 20 at 11:00 AM, with burial at the Logan Cemetery. Friends may visit at 10:00 AM. The family is eternally grateful to the members of the North Logan Third Ward who gave of their time, friendship, rides, vegetables, and love to LaRae during her 17 years alone. Her best friends Kathy King and Norma Christiansen, greenhouse man Logan Bingham and his family, home teachers Max and Allene George, water master Ray Malouf and his family, and neighbors Doug and Printha Sorenson so brightened her days with their joy and kindness. Condolences can be expressed online at www.allenmortuaries.net.